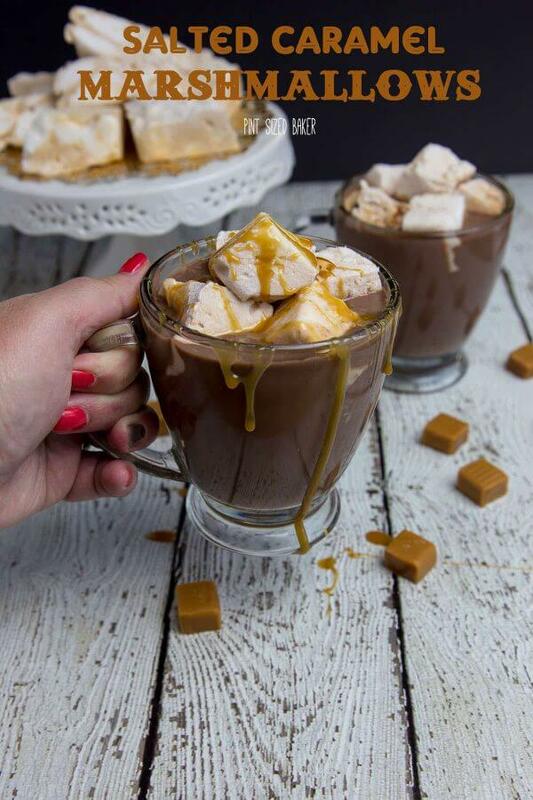 This fall make some Homemade Salted Caramel Marshmallows for your hot chocolate and dessert recipes. It’s busting with sweet flavor! Fall is in full swing in the Mid-Atlantic. It’s time for layers of sweaters, fuzzy socks, and scarves while enjoying the wonderful fall flavors of cinnamon, caramel, and cardamom. I love all the deep aromas that fall brings to baked good. It’s also time for all the warm cozy drinks like hot chocolate, mulled cider, and pumpkin spiced coffee. 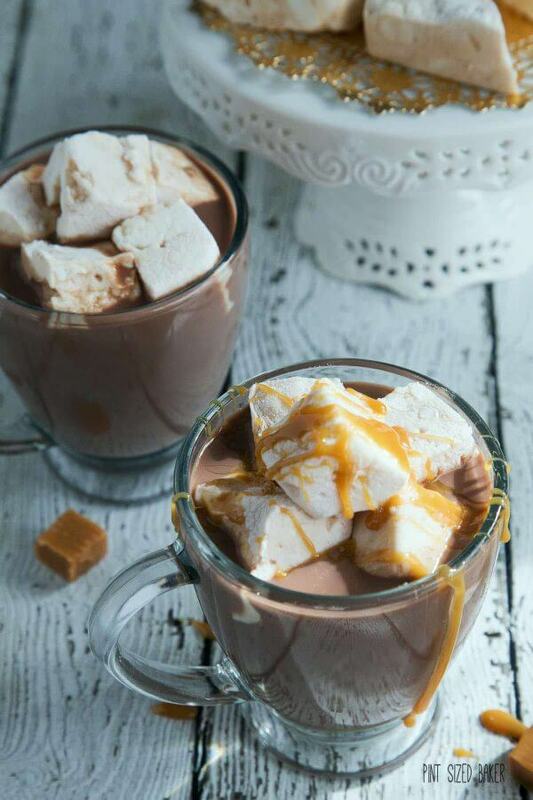 These Homemade Salted Caramel Marshmallows are perfect for topping your favorite hot chocolate. 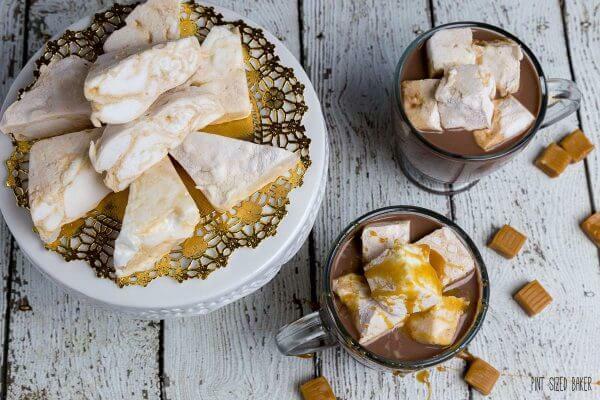 Made with stove-top caramel and egg-free marshmallows, these are sure to be a perfect addition to your autumn sweet treats! Mix together the powdered sugar and cornstarch. You will use about ½ cup of the mixture for this recipe. Label and store the remainder for more marshmallow treats! Stir togeher the sugar, water, and corn syrup in a small pot and cook over high heat. Stir until the sugar is dissolved and it starts to bubble. Once it starts bubbling, STOP stirring. When the caramel reaches a light amber color remove the pan from the heat and quickly whisk in the heavy cream and salt. Transfer the prepared caramel to a bowl to cool while you make the marshmallows. Whisk the gelatin and cold water in a small bowl and let soften for 5 minutes. Stir the sugar, ¼ cup of corn syrup, water and salt in a medium pot over high heat. Bring to a boil stirring occasionally and bring to 240F. While the sugar is heating, pour ¼ cup corn syrup into a mixing bowl. Melt the gelatin in the microwave for 10 seconds, or until melted. Pour the gelatin into the mixing bowl and, using the whisk attachment, set the mixer on low and let it run. When the syrup reaches 240F, slowly pour it into the running mixing bowl. Increase the speed to medium and set a timer for 5 minutes. Increase the speed to medium-high and run for another 5 minutes. Turn the mixer to high for 2 minutes more and beat in the vanilla extract. Once the marshmallows are done, scoop about ¼ of the batter into the bowl with the caramel. 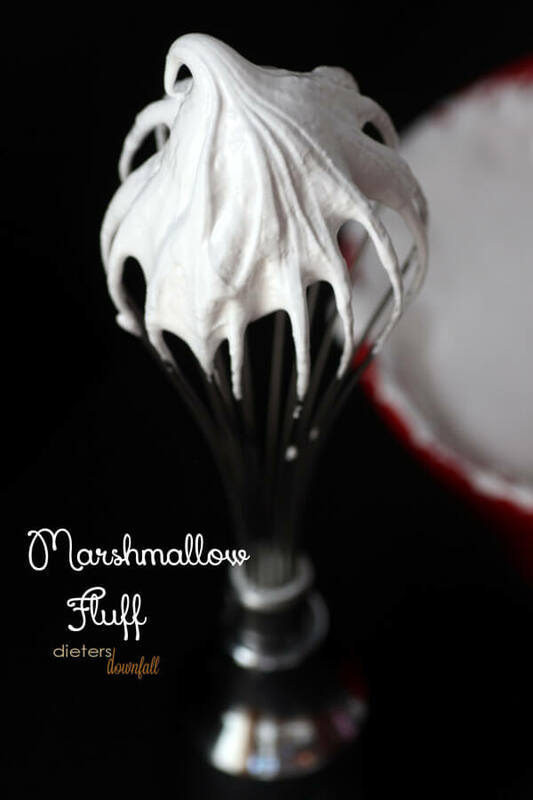 Whisk the mixture together and then return it to the large mixing bowl of marshmallow. Fold together using a figure-eight motion. Pour the marshmallow into a greased 8x8 pan and smooth with a greased offset spatula. Sift ¼ -1/3 cup of the coating over the top of the marshmallows and let them sit uncovered for at least 6 hours or overnight. Use a knife to loosen the marshmallow from the pan. Flip the marshmallows out on to a cutting board covered in coating. Add another ¼ - ⅓ cup of coating over the sticky side of the marshmallows and cut into large 2x2-inch square or smaller 1x1-inch squares. Be sure to coat the sticky cut edges in more coating. Read the directions over and over again! Be 100% familiar with the process because things can move quickly. Grease everything. 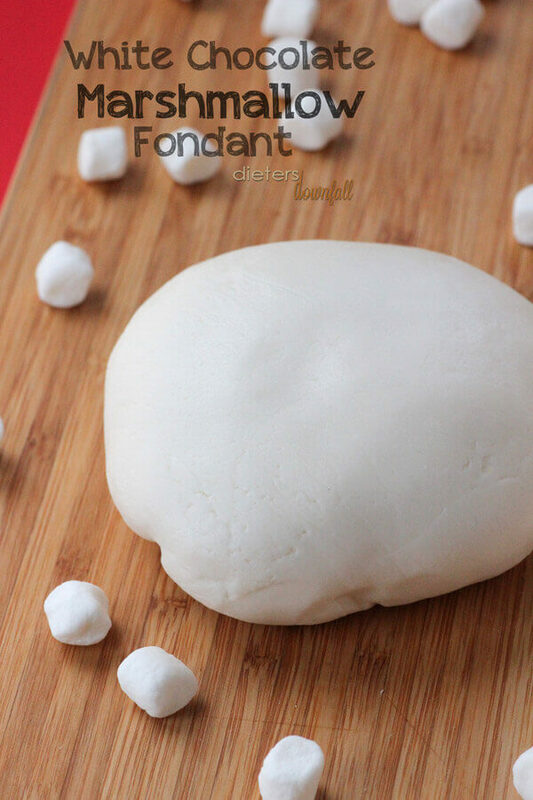 Marshmallows are super sticky and will get on your hands, clothes, countertops, utensils, and equipment. When in doubt, lube up! Get a good quality candy thermometer. I ended up tossing my first batch because things got TOO hot and it just didn’t turn out. Use a sturdy stand mixer. You can getaway with a hand mixer, but it will take longer to get to stiff peaks. 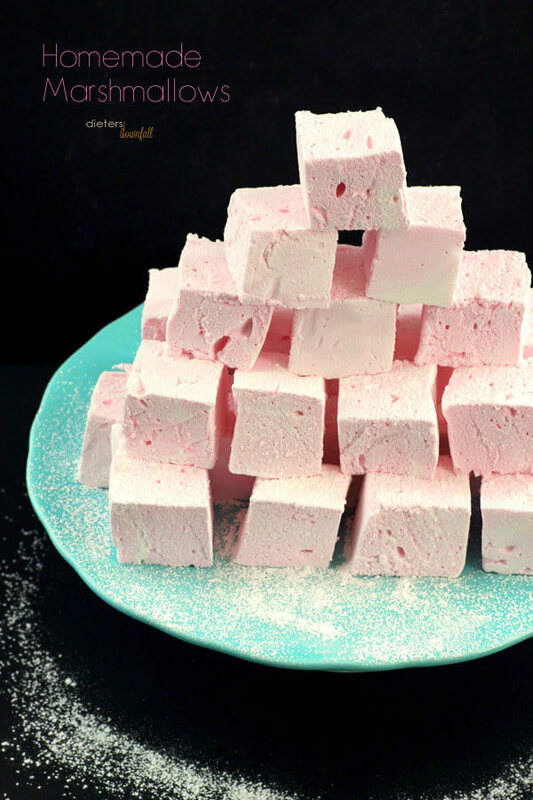 I have to tell you how many times I made these marshmallows… The first time I had three little girls “helping” me in the kitchen and I got all the way to whipping before I realized that I forgot the gelatin. The second time around, I put all of the corn syrup into the sugar on the stove and didn’t realize it until I went to the mixer. The third time, I thought I would try to get the marshmallow fluffed first and then get the caramel in, but by the time the caramel was ready, the darn marshmallows were too thick for smooth folding. UGH! This recipe took me forever to get done. But it was so worth it! If you don’t want to take the time to make your caramel on the stove top, grab a jar of salted caramel at your store. Yes, a general brand will do fine, but I suggest you look for a high quality, small batch of caramel from a gourmet store. 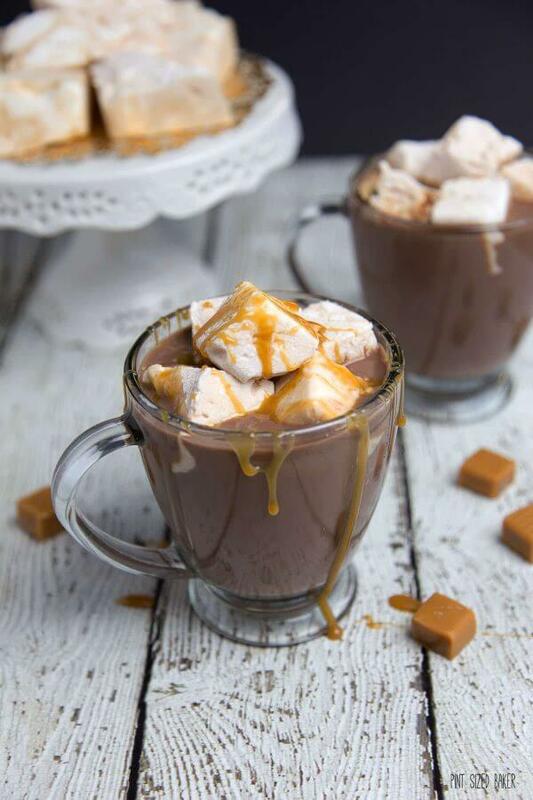 I used jarred caramel for my drizzle topping on the hot chocolate. YUM! Oh my word! I am DROOLING!! I need to make these ASAP. Thanks for sharing the recipe. Those look perfect and oh so scrumptious! 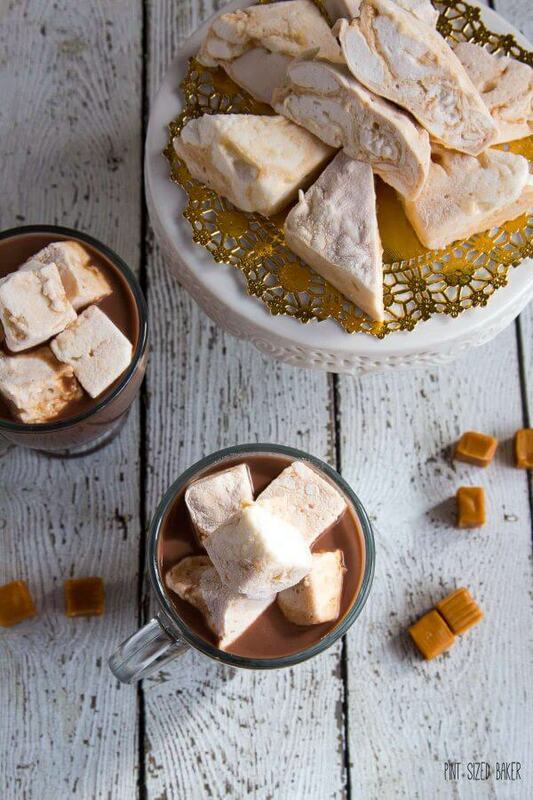 These mallows would be fabulous in hot chocolate! That caramel…omg, I just want to reach into my screen right now. You do good work Karyn. It’s 1 am and I want to run into my kitchen and make these right now. Excuse me while I pick myself off the floor! I’m not sure that these would make it to top anything except into my mouth! Oh my gosh…I need to make these happen soon! Love the photos and this idea is GENIUS. Homemade marshmallows are the only ones I’ll eat. Store-bought just weird me out. 😉 These look fantastic! I need all of these for my hot chocolate……like as in the whole batch!